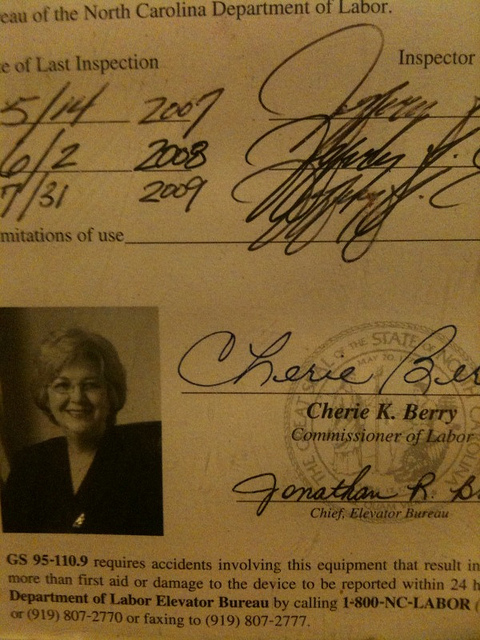 This month, PPP included Cherie Berry, the “Elevator Lady” among the candidates for the NC GOP Senate nomination. The poll hasn’t been released yet, but in a teaser on their Twitter feed they reveal that Berry leads the Republican field. Berry, of course, serves on the Council of State as Commissioner of Labor. She hasn’t been touted as a Senate candidate, however. Nor do I think she’ll end up making the race. She does, however, have some attributes that would make her a good candidate. For one, she’s a woman. Gender gap problem solved. She’s had repeated electoral success as a statewide candidate and has a folksy demeanor that should go over well with voters. Assuming that she could withstand the increased scrutiny that comes with a Senate race, I think she would make a fine candidate. If she entered the race, however, she would certainly not clear the primary field. The question is, does she want it? I don’t think she does. There are far more ambitious candidates out there, and I think Ms. Berry is happy in her current job. But stranger things have happened.